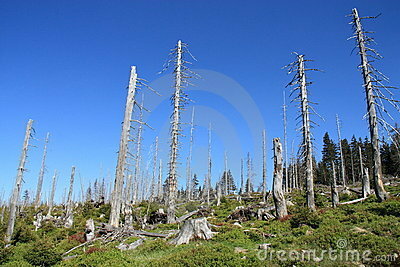 Trees in the Polish mountains destroyed by acid rain. Acid rain is a rain or any other form of precipitation that is unusually acidic, meaning that it possesses elevated levels of hydrogen ions (low pH). It can have harmful effects on plants, aquatic animals, and infrastructure through the process of wet deposition. Acid rain is caused by emissions of sulfur dioxide and nitrogen oxides which react with the water molecules in the atmosphere to produce acids.